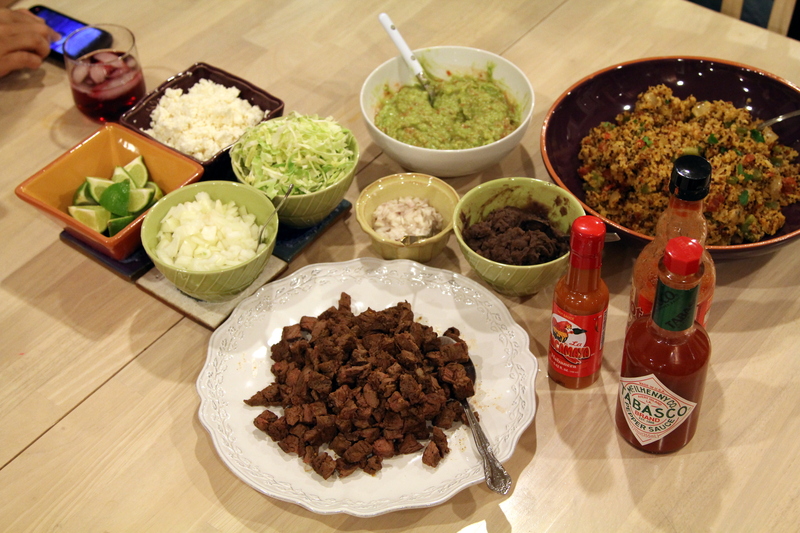 Huaraches and Spanish Quinoa [recipe] – Cin Cin, Let's Eat! To celebrate our dear friend’s big 30 a few weeks ago, we went on a Foodie Adventure tour in the Mission District of San Francisco. Mission district isn’t exactly a touristy area, most people associate San Francisco with Fishermen’s Wharf, Ferry Building, and shopping at Union Square…but there is so much more to this city than that! Mission district has such a colorful and vibrant scene, while the Western side of Mission is filled with shops and boutiques, the Eastern neighborhood is influenced by its large population of Hispanic residences. With taquerias and hole-in-the-wall ethnic eateries at every street corner, this was where we explored and ate to our hearts’ content! For all the details on the Mission tour, please visit the birthday girl’s blog – ike’s bites – as she wrote a wonderful post on this lovely day. I highly recommend doing the Foodie Adventure if you’re interested, they go to China Town and North Beach as well. We bought a pack of huaraches to bring home. Huarache (meaning sandal) is an oblong “sandal” shaped dish made with masa, topped with sauces, meats, and queso fresco. The particular kind we brought home was filled with black beans, chicharones (fried pork rinds) , and nopales cactus. 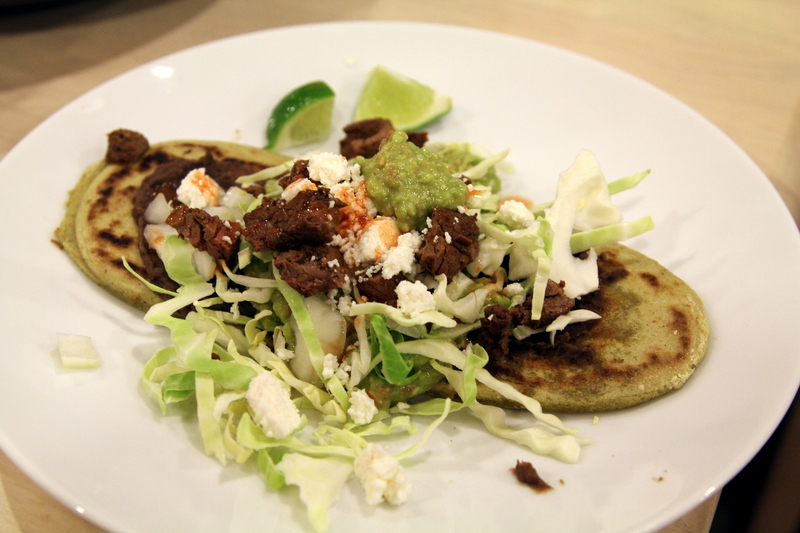 We had a mini huaraches party a week later where we pan-fried the masa base and topped with more refried beans, carne asada, guacamole, cabbage, queso fresco, and lots of hot sauce. 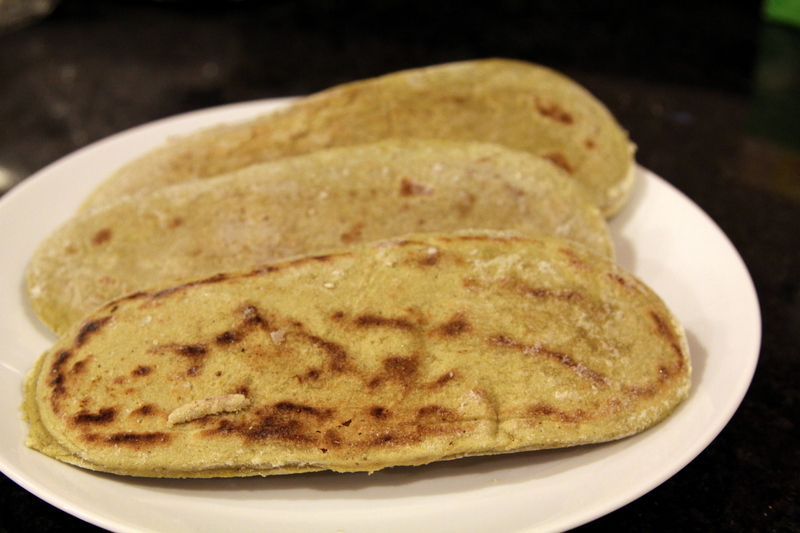 I wanted to make a starch dish to accompany the huaraches. 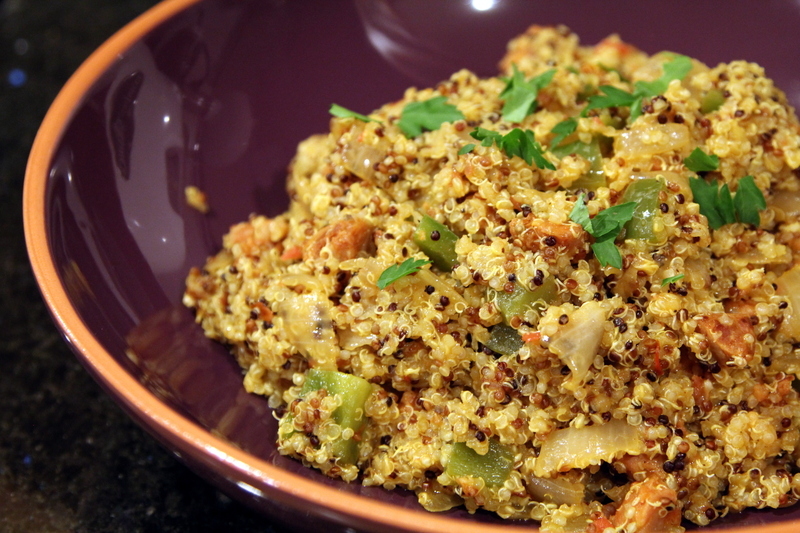 Spanish rice came into mind since I had chrizo and bell peppers on hand, but I substituted the rice with something much healthier – quinoa. I’ve never cooked with quinoa before but made a point to eat more of it this year along with other healthier grains, and I was very happy with how well it turned out! 1. Add the quinoa to the water or broth, along with a pinch of saffron. Bring to boil. Cover and let simmer for 15+ minutes until the quinoa absorbs all the liquids. They’re cooked when they appear translucent and the white germ rings are clearly visible. 2. In the mean time, heat a skillet or pot with 1 teaspoon of oil. Cook the chorizo and let the fat render for a bit. 3. Add onion and garlic to the skillet, cook for another 2-3 minutes until the onions are translucent. 4. Add the bell peppers, cook for another minute. Season with salt and pepper. 5. When the quinoa is done, add the chorizo mixture to quinoa and mix. Taste and season accordingly. 6. Right before serving, top with parsley and lemon wedges. That looks like a fun way to celebrate. The dishes are gorgeous. Ooh I may borrow this recipe soon. Did you have any concerns that the quinoa would come out dry? I only made it once at a work event. It came out dry and I didn’t try my hand at this grain again. But now I think I will. Thanks, Chef purpl3licious!